Note: All times are local. Rabbitohs vs Warriors is being played on the Sunshine Coast. Friday 6pm: There has already been some showers present on the Gold Coast this afternoon, most likely to have brought around 7-10mm to the stadium. The weather during the Friday evening match is most likely to be fine, however this is only slightly higher than the chance of any rain (55% vs 45%). The airmass is expected to remain relatively moist, and combined with the light to moderate winds, is expected to leave a moderate to high amount of moisture remaining on the playing surface during the match, from the earlier showers. Friday 8pm: The Friday night match up in Townsville is expected to see fine weather. Low humidity levels are forecast, with mild to warm game temperatures, and a moderate amount of dew on the playing surface. Saturday 3pm: Is most likely to be fine on the Sunshine Coast, however there will be one or two isolated showers about the area at any given time (most likely during the morning, and also during the evening, following the match). Humidity levels will be slim to nonexistent, and game temperatures will be mild to warm in the southeasterly winds. Saturday 5:30pm: It will be fine in Newcastle for the Saturday evening match. A moderate amount of dew will develop on the playing surface as the match goes on. Saturday 7:30pm: Fine weather is also expected in Cronulla for the Saturday night match. A moderate to high amount of dew is expected on the playing surface. Sunday 4pm: Isolated to scattered showers are expected close to the coastline on Sunday afternoon, some of which will make it onshore to around the Kogarah area. At this stage there is a slightly higher chance of rain impacting upon the match than it remaining fine, and there is a little computer model uncertainty in the forecast, so this forecast may be updated on Sunday morning. Sunday 6pm: There is the possibility of a light shower (or brief patchy rain) around the Canberra during the Sunday evening match, however any of this activity is most likely to occur beforehand. So the most likely scenario is for fine weather during the match, with a moderate to high amount of dew on the playing surface. 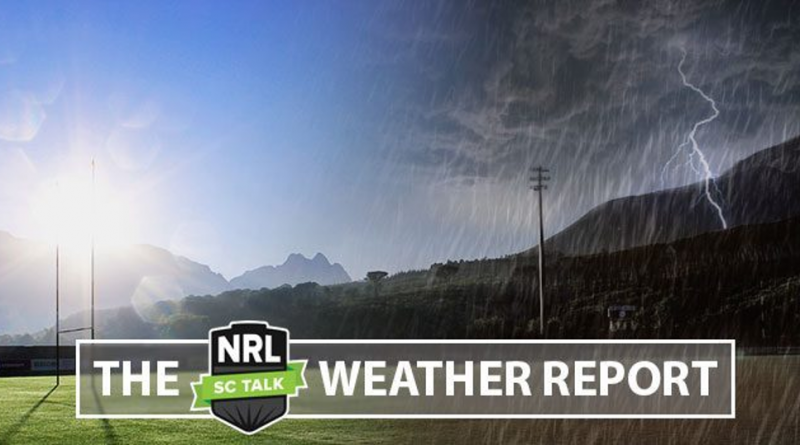 Serc is meteorologist who sends tailor made, and highly accurate forecasts to some NRL clubs (and many other industries). We are very happy to have him on board NRLSCTalk in 2017.